BMW X6 would be the company’s ‘X’ fourth product in the country as it already offers X1 entry-level SUV, X3 mid-sized SUV and X5 premium SUV. 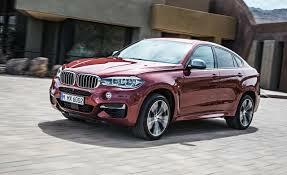 As for the second-generation BMW X6, it is 40 kgs. lighter than the outgoing model. The chassis comprises of high-strength steels, thermoplastics and aluminium, which has helped immensely in the weight reduction. Moreover, the centre console of the SUV is made from Magnesium, which makes it even more ligher in weight. The 2015 X6 would continue the traditional 50:50 weight distribution on the front and rear axles. Apparently, BMW would launch the xDrive40d variant of the X6 in India. Just so you know, BMW X6 would rival the Mercedes-Benz GLE-Class coupe. The side profile too now has duel character lines which according to BMW words are called swage lines. The first of those Swage lines appears from the from the front wheel arches and rises and ends up in towards the to the rear door handles. While the second swage line runs on the lower half of the vehicle and ends towards the rear tail lamps. You also get a new air breather on the X6 which not only adds sportiness to the design but also helps in improving ventilation and efficiency.